Food bars for breakfast may help reduce the weight of supplies carried on the Orion capsule for deep-space missions. 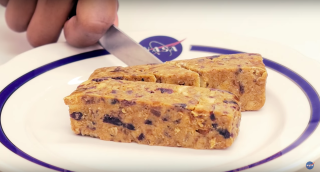 Whereas astronauts on the International Space Station get to feast on turkey and candied yams this Thanksgiving, deep-space travelers on NASA's future Orion mission may chow down on retro food bars. Because there is limited space inside the Orion capsule, NASA food scientists at the Human Research Program (HRP) are working to reduce the amount of food and supplies astronauts need for longer trips, as well as cut down on the waste they create. As a result, the scientists have developed high-calorie food bars that astronauts can substitute for breakfast. The researchers described this work in a new video. "When you have 700 to 900 calories of something, it's going to have some mass regardless of what shape it's in, so we've taken a look at how to get some mass savings by reducing how we're packaging and stowing what the crew would eat for breakfast for early Orion flights with crew," Jessica Vos, deputy health and medical technical authority for Orion, said in the statement. "When you think about multiweek missions in Orion, having just one package for breakfast items for crew will help us limit the space we need to store them." Reducing weight aboard the Orion capsule is important, as "a heavier spacecraft requires more fuel and energy to propel it to its ultimate destination," NASA officials said. In comparison, astronauts on the space station have about 200 meal options to choose from, and even get a special Thanksgiving dinner, including turkey, candied yams, cherry-blueberry cobbler, mashed potatoes, cornbread dressing and green beans, which Expedition 50 Cmdr. Shane Kimbrough showed off in a new NASA video.Astronauts on the orbiting lab have this array of options because space station meals come from thermostabilized or rehydratable packages sent from Earth. However, there is not enough room on the Orion capsule to store enough of these packages for a crew on a multiweek mission. Stowing food bars will reduce the amount of storage needed for breakfast and allow Orion crews to chow down on lunches and dinners similar to what space station crewmembers eat. However, NASA food scientists "also have to consider how the bars will affect crew morale, since food choice, variety and taste are important aspects of ensuring they consume enough, especially as mission lengths increase," NASA officials said in the statement. NASA scientists have tested the food bars for flavor, texture and long-term acceptability so that they can determine the best possible meal-replacement option for the first manned Orion mission, expected to launch as early as 2021.